It's ok Rooms are old but tidy. Surrounding area can do with a clean up and some renovations will be nice. Quit getting the green-eyed monster over your mates' over-saturated travel pics. With so many accommodations in The Entrance on offer, it's easy to get your own envy-inducing holiday on. Let's get real — pretty much everyone wants to stay in the thick of the action. Lucky for you, there are 23 hotels within 5 kilometres of downtown The Entrance on lastminute.com.au. Avoid the FOMO — be close to all the action at the Kims Beachside Retreat and the Lavender House B&B. 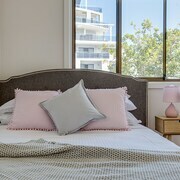 We wouldn't be doing our job properly if we didn't also tell you about the Waldorf The Entrance Serviced Apartments and the Oaks Waterfront Resort. Think about choosing one of the 9 hotels in Gorkan - Toukley, which is located 9 kilometres outside of the middle of town. Be quick! 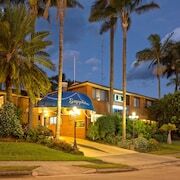 Some exceptional options are the Norah Head Holiday Park and Hibiscus Lakeside Motel. Bring your bikinis or boardshorts and a pair of goggles to The Entrance Ocean Baths and dive in! Swim a few laps or just splash about in the water. Need a room for the night nearby? No probs, we've got you covered. El Lago Waters Motel and Two Shores Holiday Village are practically on the doorstep! Blue Bay Beach is a gorgeous patch of coastline that's worth visiting whatever the season. If you'd rather kick up your feet near this attraction, check out the Ocean Front at The Entrance and Al Mare Beachfront Retreat. Unfortunately, there are only a handful of budget accommodations for money-conscious travellers. Of these, El Lago Waters Tourist Park is up there with the best. After more options? The Bells At Killcare is situated 25 kilometres away from the downtown area, and the Pullman Magenta Shores Resort is 4 kilometres away. 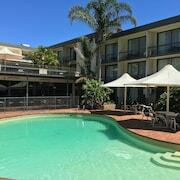 The Avoca Palms Resort Apartments, 15 kilometres away, and the Crowne Plaza Terrigal, 12 kilometres away, are some further alternatives. Matcham is another place where you can kick back and get acquainted with the room service menu. Sitting 11 kilometres southwest of The Entrance, it's where you'll discover the Toonwoon Bay Beach and Swadling Reserve. 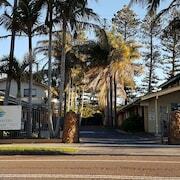 If you'd like to visit Matcham, consider the rates at the Apollo Resort Wamberal and Tiarri Terrigal. 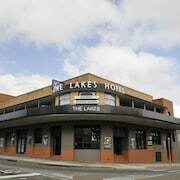 11 kilometres to the north of The Entrance you can also stay at Lake Haven, home to the Canton Beach Holiday Park and Toukley Motor Inn. Whether you're shooting through or staying in Lake Haven, set aside some time to visit Norah Head Lighthouse and Wyrrabalong National Park. Having been scrunched up in a cabin seat for hours, a seriously cosy bed at the Rydges Sydney Airport Hotel will feel like a dream! If it's chockers there, try the Mercure Sydney International Airport. 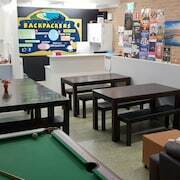 Both are just a short drive from Kingsford Smith International Airport, which is 75 kilometres from the centre of town.